Signed as a free agent on Jan. 18, 2019. 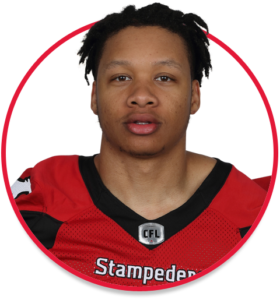 Holmes originally signed with the Stamps on Oct. 24, 2018, and spent one week on the practice roster. He attended rookie mini-camps with the National Football League’s Seattle Seahawks and Indianapolis Colts in May of 2018. He signed with the Seahawks on Aug. 8, 2018, and was released on Sept. 1, 2018. (Calgary) Holmes spent one week on the Stamps’ practice roster. Holmes played 39 games over four seasons (2014-17) at Michigan State. During his career with the Spartans, he carried the ball 295 times for 1,302 yards and 14 touchdowns and added 29 catches for 220 yards and one score. Holmes rushed for a career-high 540 yards and eight touchdowns as a sophomore in 2015. Holmes was a first-team all-state selection as a senior at Carman-Ainsworth High School in Flint, Mich., after rushing for 1,023 yards and 14 touchdowns. He earned a degree in studio art at Michigan State and worked as a freelance photographer among other jobs while waiting for professional football opportunities.